Base of Operations: Shadowbase, in the Project: Homegrown Complex, Washington D.C. 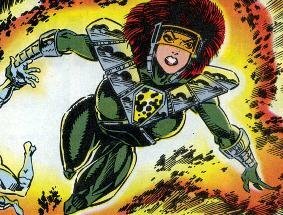 Powers: Each member of Shadowforce wears a harness that temporarily alters their body chemistry granting induced super powers. While each one member is affected in different ways and gain different powers, it is assumed they all have increased physical abilities (athlete to peak human agility, strength and durability). Limitations: Without their harnesses they were powerless. Major damage to the harness could result in the death of the wearer. Formerly they needed to continually be re-energized by broadcasts from the power core at the Project: Homegrown Complex. Later they developed battery packs as power sources. Disabling the battery packs would render them powerless. History: (Spider-Man/X-Factor: Shadowgames#1 (fb)) - The Shadowforce process was developed by Project: Homegrown using fragmentary data and incomplete records from the super soldier serum, the Fantastic Fours space flight, the gamma bomb explosion that created the Hulk, the Nuke protocols, data on the Abomination and more. Secretly six convicted criminals were taken from different prisons, and it was made sure the national crime database still registered them as incarcerated. They were experimented on using the shadowforce process, but it was unstable. General Sharpe had the Shadowforce team doped and brainwashed into kidnapping super beings (except known mutants who are born with the x-factor and those with mechanical powers) to scan and study the to help stabilize the Shadowforce process. They started by looking for Spider-Man. 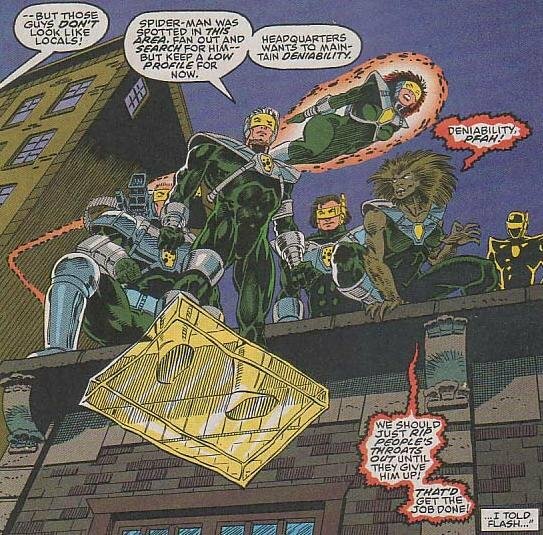 Peter Parker was with a boys' club that his friend Flash worked with when they spotted Shadowforce outside. Peter made his excuse and slipped out as Spider-Man. (Spider-Man/X-Factor: Shadowgames#1) - Shadowforce attacked Spider-Man. During the confrontation Flash Thompson and the boys came outside to watch Spider-Man in action and Flash started taking photos. Hardtime reported this to Sharpe who said he would deal with it. Mirrorshade duplicated Spider-Man's abilities and distracted him long enough for Airborne to shoot him with tranquillizers. Shadowforce took him back to Shadowbase where they underwent sleep suggestion programming. Meanwhile, Sharpe's men attempted to get Flash's photos of Shadowforce from J. Jonah Jameson at the Daily Bugle. Back at Shadowbase, the team's sleep suggestion programming was interrupted when X-Factor (called in by Flash Thompson) arrived to help Spider-Man, who had escaped from his bonds and downloaded information on Shadowforce and Project: Homegrown. During the confusion Mirrorshade escaped. (Spider-Man/X-Factor: Shadowgames#2) - Spider-Man followed Mirrorshade while X-Factor battled the rest of Shadowforce. However, Shadowforce were sent after Spider-Man to retrieve the disc. Shadowforce outmaneuvered X-Factor and left. Mirrorshade used the trains to get to New York, and Spider-Man followed. The rest of Shadowforce searched the train and drew Spider-Man out. Spider-Man disconnected the passenger section of the train to get the passengers out of harm's way, and he threw the crew to safety before stopping the engine section of the train. As Spider-Man confronted Shadowforce, X-Factor arrived to help. Unfortunately, Shadowforce realized they were out of the command range of Project: Homegrown and escaped on the train. Meanwhile, Mirrorshade had located Flash Thompson and was preparing to kill him. (Spider-Man/X-Factor: Shadowgames#3) - Spider-Man and X-Factor arrived just in time to save Flash, but Airborne escaped with Mirrorshade. Shadowforce returned to the Project: Homegrown complex and took it over. They demanded their sentences be commuted to time served, on prosecution and a free pass out of the country. While they claimed that they were coerced into capturing Spider-Man, Sharpe started to blame everything on them. They developed battery packs as an alternate source of power so they could overload the complex's power core. Spider-Man and X-Factor infiltrated the complex in an attempt to stop them, and they fought. Mirrorshade died when his harness was damaged. Polaris disabled the remaining packs, except for Hardtime's. 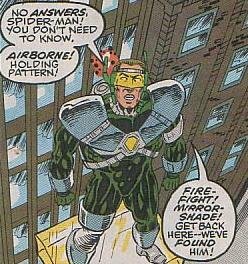 Spider-Man convinced Hardtime to surrender rather than let Sharpe blame everything on Shadowforce, and Hardtime helped them all escape the explosion of the complex. As Spider-Man was downloading the information on Shadowforce and how they were looking for superhumans to study we saw pictures of the Fantastic Four, Darkhawk, Speedball, Sleepwalker and Captain America. 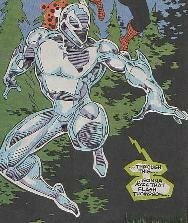 While I know data on the FF and Cap were used in the Shadowforce process, I'm not sure why Darkhawk, Speedball and Sleepwalker were pictured; were they intended future victims of Shadowforce, or had data on them been used in the process? Sleepwalker wouldn't seem to fit the bill anyway as he's an alien and was presumably born with his powers as are mutants. It's possible Project: Homegrown got data on him from the Office of Insufficient Evidence but they knew he was an alien. However, aliens were not specifically ruled out and mindscape energy has been known to mutate humans in the Sleepwalker comics. 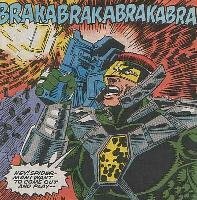 Data on Speedball could have been taken from Genetech (who created Psionex using information on the New Warriors that had been gained by the Mad Thinker). 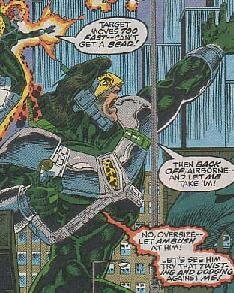 Early in his series, lots of villains thought Darkhawk's amulet was the key to getting superpowers for themselves; primarily Bazin (who commissioned several tests on him in various circumstances), but also Hobgoblin/Phillip Macendale (who was employing Bazin initially) and Tombstone. The government could've definitely gotten the data from Bazin. Darkhawk is an android, so data on him probably wouldn't have helped out Project Homegrown, but there's no reason *they'd* know that. As for the human scientist in the Darkhawk project: He was abducted to earth and convinced to join the project through shock treatment. As far as we know, he didn't have any human assistants. He and one other Darkhawk scientist survived the destruction of the Project by beaming their minds back towards earth, where they inhabited the bodies of two scientists at a government SETI installation. They then recreated an amulet to give them access to a Darkhawk body, to protect themselves from a former boss. At no point in their story can I see them giving information to the government. While their power packs were disabled at the end of the story line, there is no reason why they couldn't be repaired. Despite their background as criminals, at least Hardtime showed he could be reasoned with. If they were to return who is to say they would still be the bad guys? Of course a Spider-Man/X-Factor reunion isn't exactly on the cards at the moment! A note on Airborne's speed. She was supposedly faster than Polaris but didn't appear to travelling at supersonic speeds (there was no sonic boom). The Marvel Encyclopedia Vol2: X-Men claims Polaris has a speed of Mach-2 through to Orbital Velocity. Perhaps she does these days, but I'm pretty sure she was no where near that fast then. Heck if she can fly that fast why would she need to get in the jet with the rest of the team? However, the Marvel Encyclopedia Vol2: X-Men also claims that Beast can lift/press in the 25-75 ton range and quite a few other things I'd more than happily disagree with! I'm sticking with subsonic speed for Airborne on account of not 'hearing' her break the sound barrier. --In defense of the 'Pedias and Handbooks, since I write them, I can tell you that the writers have nothing to do with the Power Charts. We frequently don't agree with them, either, and we'd prefer they were not included. I'll let you know when I meet someone who likes them...--Snood. Danny Fingeroth made a point of stating in each issue of Spider-Man/X-Factor that the events took place before X-Factor#100, the issue in which Madrox supposedly 'died' (it has since been revealed that it was one of his 'dupes' that died). The individual members' real names were revealed in Nuke's profile in OHOTMU A-Z Hardcover#8. As her name suggests Airborne can fly, doing so at subsonic speeds (250-500mph) see comments. She is propelled by means of an energy field surrounding her body that presumably protects her from the elements, and can also be used to latch onto others (in particular she could latch onto Hardtime's solid air platforms to drag the entire team). Even with the team in tow she could still reach optimum speed, but the limit to the pure weight she could carry in flight is unknown. She is able to shoot tranquilizer darts (and presumably standard ammunition too) from her wrists/hands. Airborne also has the standard abilities granted by the Shadowforce process. The Shadowforce process has had a feral effect on Ambush, giving her claws, fangs and a degree of enhanced human agility, speed, strength and durability. She can use her claws to climb walls, and her strength grants her enhanced leaping capabilities. Presumably she has enhanced night vision, though this was never shown. Firefight didn't display any powers beyond that of the standard Shadowforce abilities. Instead he was armed with various advanced ballistic weaponry. If he did have a power it presumably enhanced his shooting skill in someway e.g. : enhanced vision for better aim, or enhanced reflexes perhaps... I would guess a mixture of both, almost a superhuman version of Bullseye's unique talent, but that's just me! He had a variety of ammunition including non-lethal stun charges. Hardtime was the leader of the group, and a smart and effective leader at that. Team maneuvers were communicated in their own special code. He could solidify air and then control it for various effects. He could create shields to provide protection from physical and energy attacks (including Havok's plasma attacks, Strong Guy's Class 50 strength, and Polaris's magnetic attacks), or use solid air to augment his strength. By standing on his "hardshell platforms" he could levitate himself and others. Mirrorshade could duplicate any one persons superhuman powers and abilities, and then 'mirror' their moves in combat. Even without duplicated powers, he had the standard superior (though not normally superhuman) physical attributes provided by the Shadowforce process. When duplicating superhuman agility, strength or durability, those attributes combined with his own enhanced abilities. Hence, when fighting Spider-Man, he seemed to have a slight advantage, and even appeared capable of leaping farther. Also, his duplication process seemed to have a limited ability to duplicate the target's personality. However, this process was flawed, and in the case of Spider-Man it turned a 'transient irritation with Flash' into a 'murderous rage'. Mirrorshade couldn't copy more than one person's powers at a time, and powers that drastically altered his physical body ran the risk of damaging his harness. He learned that the hard way when he tried to copy Multiple Man's power. His failed attempt at created a duplicate of himself broke the harness and he died. Oversize could increase his body's size, strength, and durability to superhuman levels. He was observed reaching a height of approximately 24 feet, and had approximately Class 25 strength at that size. As the limits to his powers were not fully explored perhaps he could achieve greater size and strength. It is unknown what source he used to draw his additional mass from, but it allowed him to increase the size of his costume and whatever else he was wearing (which is fortunate otherwise he would have broken his harness the first time he used the power and ended up dead!). This was presumably a subconscious ability, and almost certainly limited to touch as he displayed no ability to increase other people or objects at a distance. Oversize also has the standard abilities granted by the Shadowforce process. All other characters mentioned or pictured are  and © 1941-2099 Marvel Characters, Inc. All Rights Reserved.